Mexican food used to be incredibly hard to find in London. Good Mexican food was even more difficult to come by. Although it’s still not especially common, it’s now much easier to find thanks to eateries like Benito’s Hat which has branches in Fitzrovia and Covent Garden. The Fitzrovia branch has a rather colourful decor dominated by a huge photomural wall of some Mexico City taxis. You order at the counter, watch your meal assembled in front of you and then either take it to your table or have it as a take away. If you like inhaling the traffic fumes from the cars passing down Goodge Street, there’s outdoor seating too. This cafeteria-style system combined with the low prices essentially makes Benito’s Hat a fast food restaurant, albeit a fast food joint that also serves beer, wine and cocktails all served up by cheerful, helpful and distractingly fresh-faced staff. 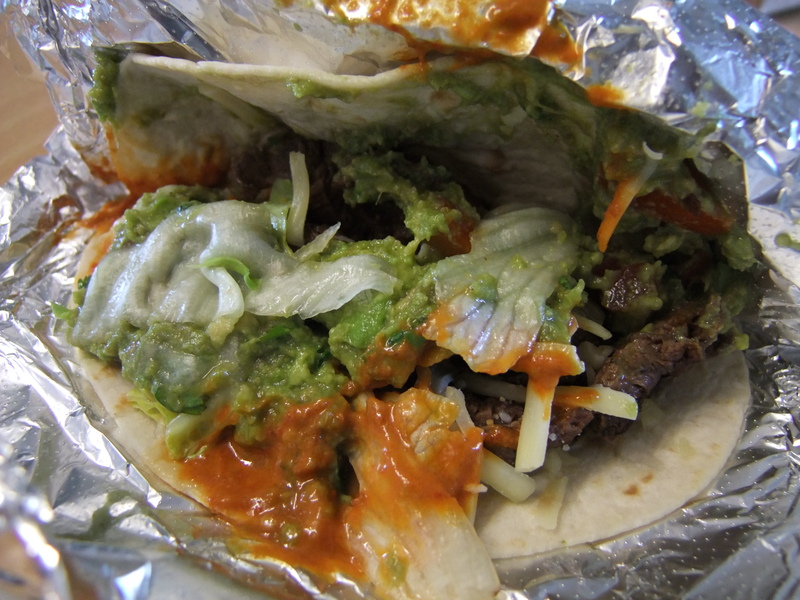 I can’t tell whether the tortillas used for the burritos are made from traditional maize flour or the more common wheat flour, but they do their job of holding in the bulging fillings well with little leakage. The filling consists of either vegetables, pork, steak or chicken accompanied by some buttery-tasting rice and your choice of either black beans or refried pinto beans. I prefer refried beans, although the version here lacks the subtle nuttiness and that I prefer. The chunks of chicken are a bit on the bland and dry side, although this is offset a bit by the generous helping of fresh coriander. Meanwhile the pork has a nice smoky flavour to it and has a pleasingly coarse texture too. 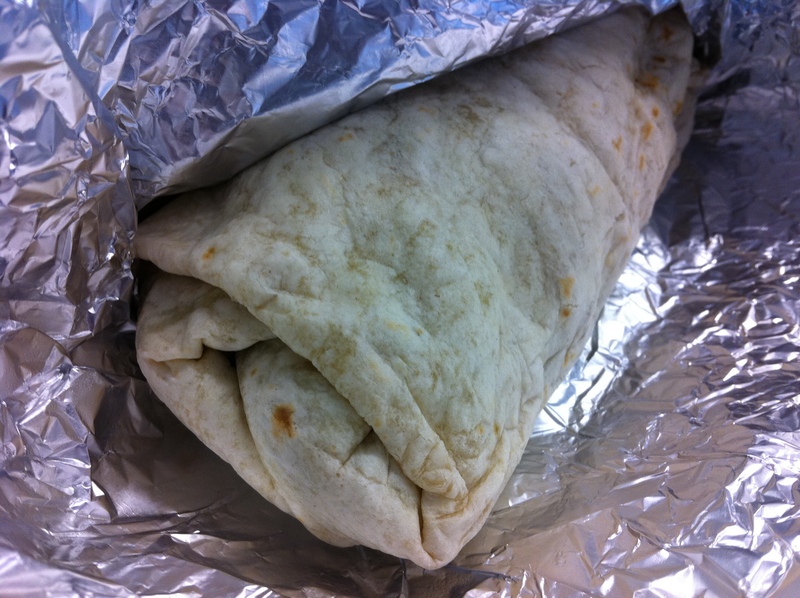 A chicken burrito. Who is this Benito bloke anyway and what’s so special about his hat? There’s also a liberal helping of some rather limp lettuce and tomatoes as well as your choice of inoffensively bland cheese, sour cream and, for an extra 50p, guacamole. 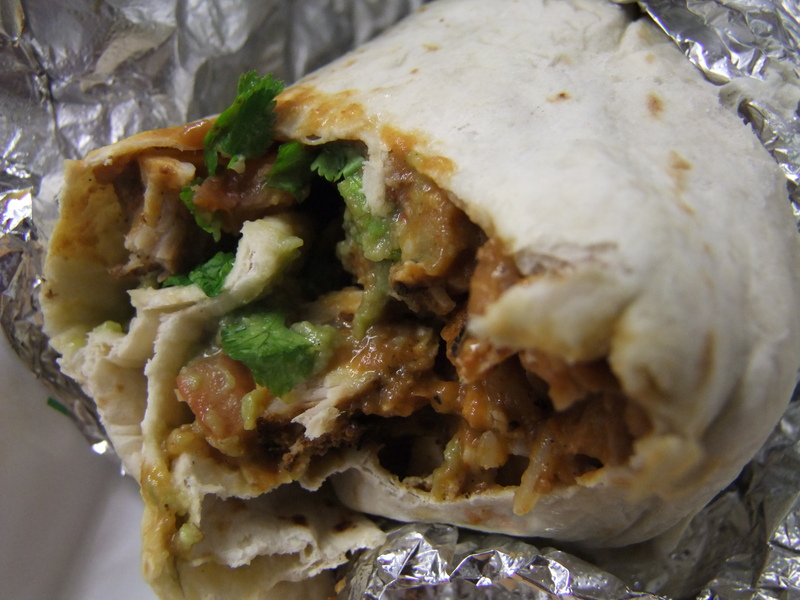 I’m not a fan of sour cream, but I love the slightly sweet, creamy touch that avocado adds to a burrito. Oddly, the spiciest salsa available was surprisingly tame on one visit and pleasingly piquant, but not overpowering, on another. The pork filling is generally far superior to the chicken. If you want something a little less heavy, but nonetheless still filling, there are the tacos instead. 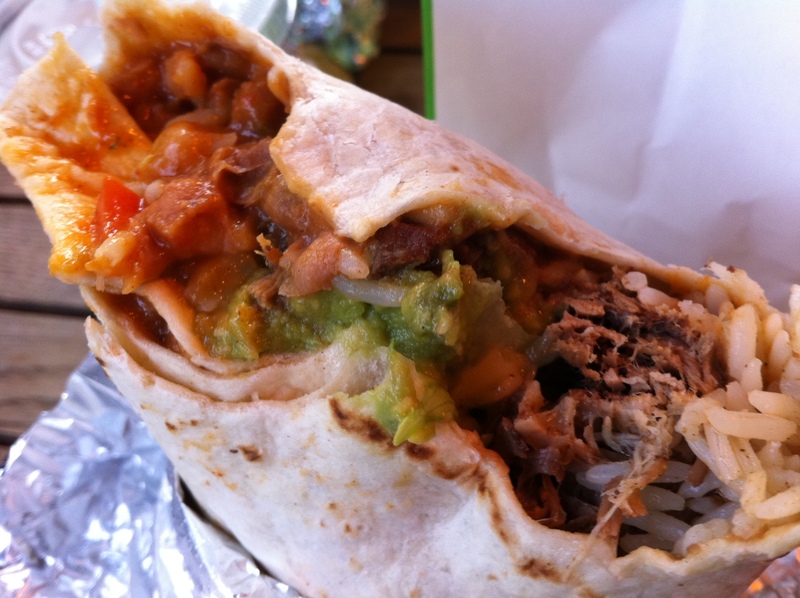 They’re much the same as a burrito, but smaller and served without the rice or beans. There’s still the same choice of fillings and sauces, but they’re not wrapped tightly and are left to flap around semi-open, so they can be a little messier. 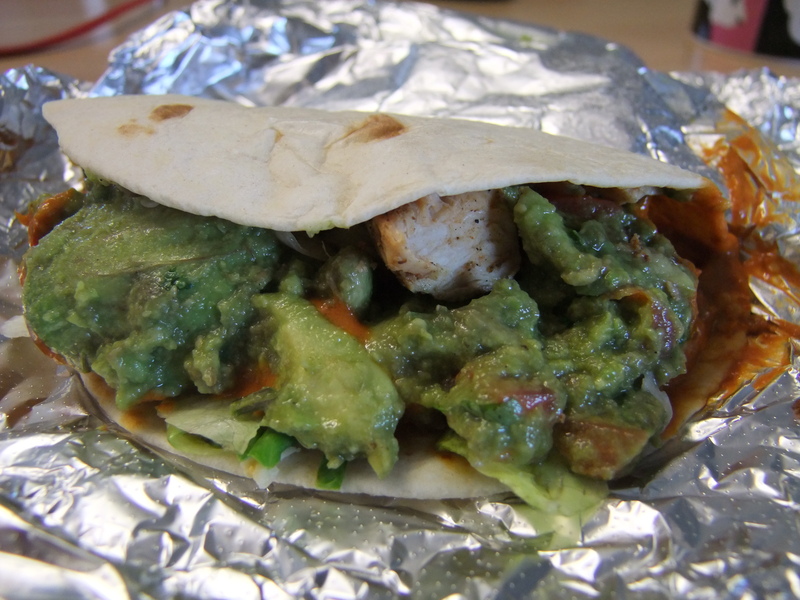 That’s a lot of guacamole in that chicken taco. The vegetable tacos consist of roasted courgettes and peppers which are juicy and not too soft. It’s hard to screw up vegetables, so thankfully they haven’t. Yes, there are actually courgettes and peppers underneath all that spicy sauce and guacamole. I wasn’t expecting much from the steak in the steak taco and that’s exactly what I got. Although tender, the chunks of beef were bland and uninteresting, much like the chicken. In retrospect I could’ve done without all that lettuce. The burritos are around the size of a small child, but if you still have room, skip the overpriced midget serving of tortilla chips (at £1 a portion, I’d expect a bag full not a handful) and try some dessert instead. 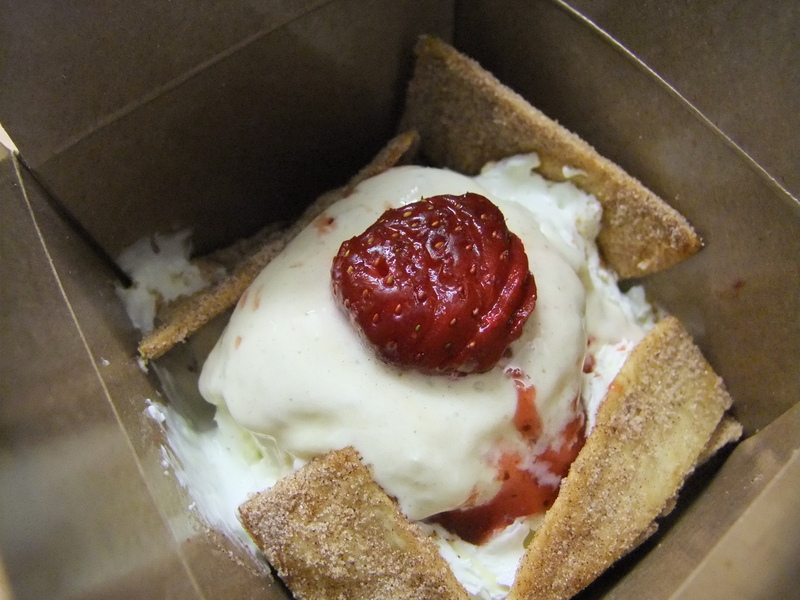 Buñuelos – star anise and cinnamon flavoured fried dough stick pieces, served here with a large dollop of vanilla ice cream and a frozen chunk of strawberry to offset the comparative dryness of the dough stick pieces. You get a huge amount of sugar and fat for your £3.50. I don’t know how authentic the buñuelos at Benito’s Hat are, but they are pleasingly moreish. If you like cinnamon-flavoured snacks, you’ll like this. 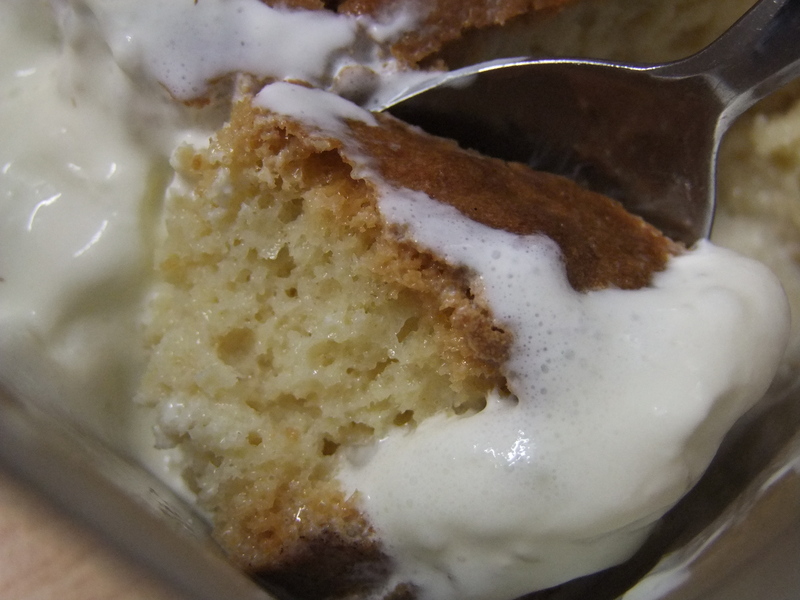 Even better than the buñuelos is the tre leche cake, or three milk cake so called because the sponge cake is dunked in evaporated milk, condensed milk and cream. 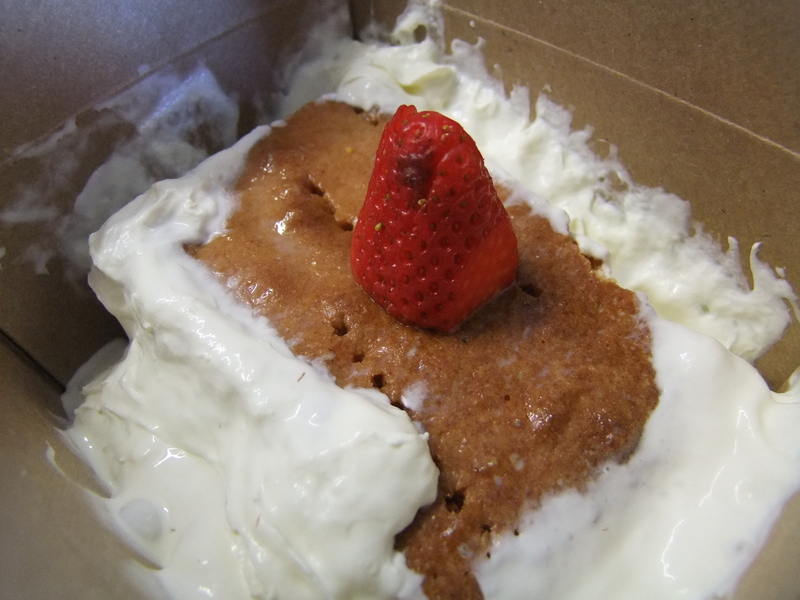 It’s therefore no surprise that it’s an intensely creamy and milky dessert. 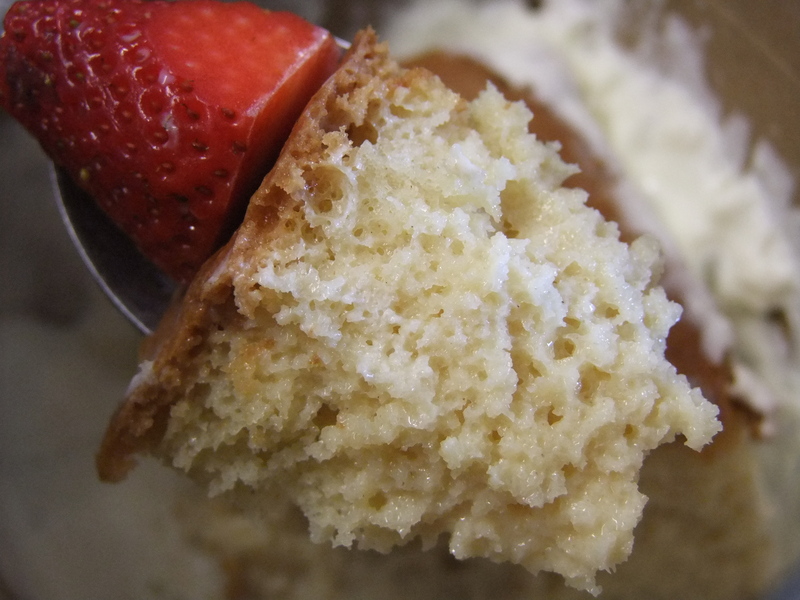 What is a surprise is that the sponge manages to avoid becoming soggy despite all that liquid. The texture of the sponge isn’t too heavy, but pleasingly fluffy and bubbly, which is a doubly good thing given the hefty slice you get for your £3.75. Bargain. Dessert portions at Benito’s Hat are not small. 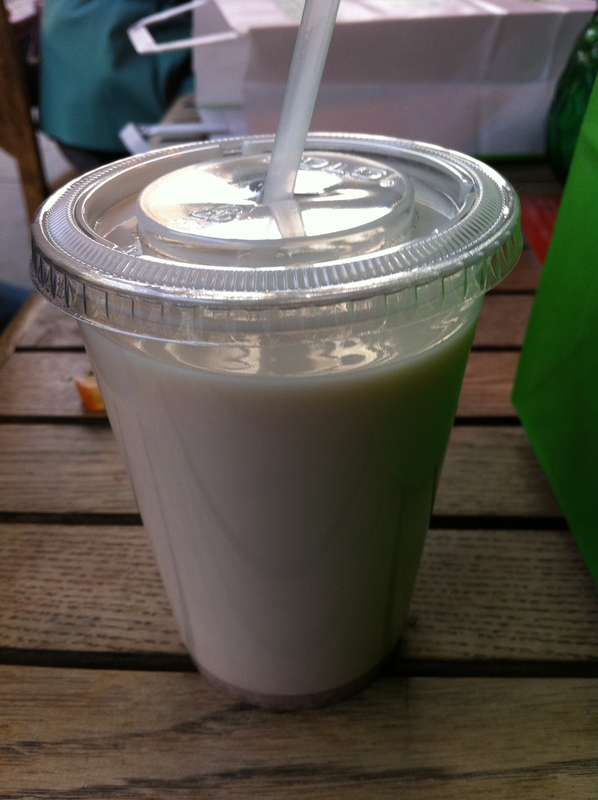 Wash it all down with horchata, a watery cinnamon and vanilla flavoured rice-based drink. The version is sweeter and not as watered down as the version found at Wahaca. It’s not only refreshing, but makes a nice change from carbonated soft drinks. Seasoned Fitzrovians will know that on weekday lunchtimes rival burrito purveyor Freebird has a stand just around the corner from Benito’s Hat on Goodge Place (there’s also another stand on the corner of Brewer Street and Rupert Street in Soho). It’s just a stand so they just do burritos, but how do the two compare? 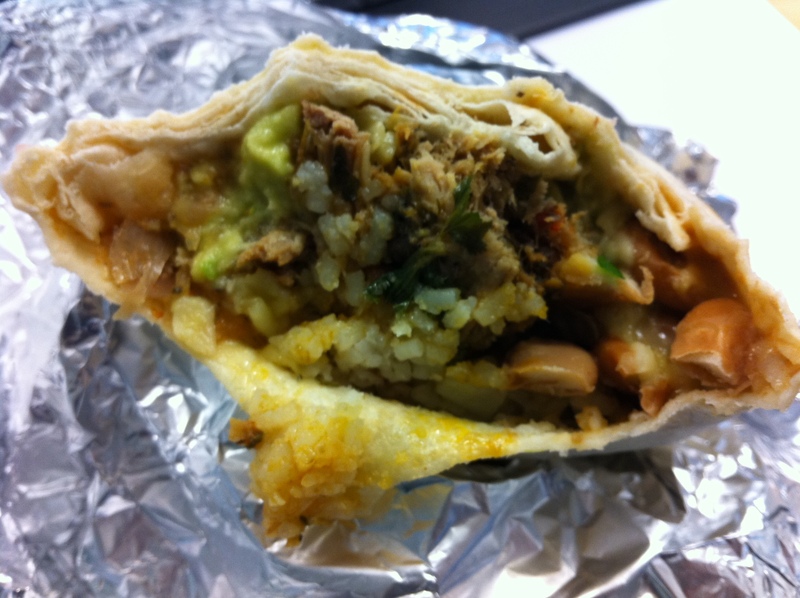 The meat in Freebird’s pork burrito has a nice citrusy tang to it, but it lacks the smoky flavour found in Benito’s version and there isn’t as much meat either. 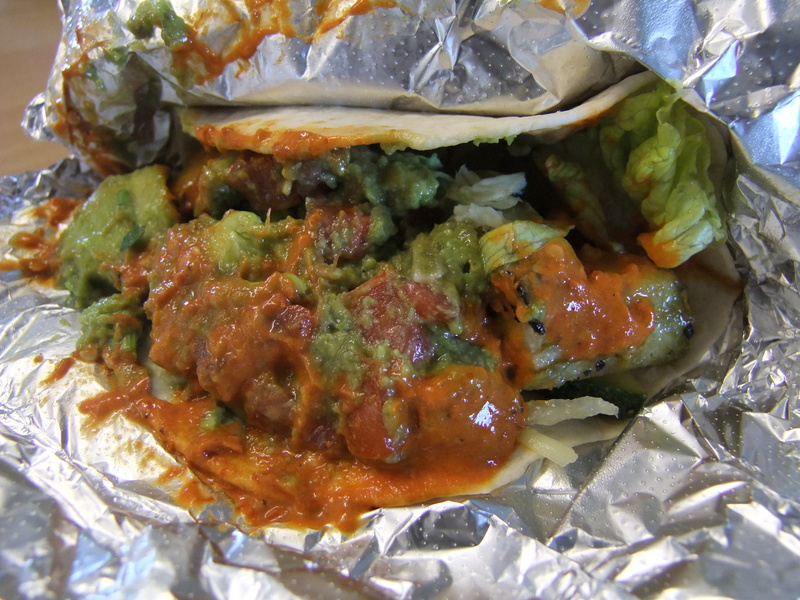 The tortilla is tightly wrapped, the refried beans are pleasingly nutty and the guacamole is suitably creamy and sweet, but the rice is just rice. The spiciest sauce available has a slightly more piquant hit than Benito’s version, but it’s not as mouth numbingly spicy as it used to be. Although Freebird’s burritos are around a pound cheaper than Benito’s, the Hat has the edge thanks to its better tasting, bigger servings of meat. I’d much rather eat at Benito’s Hat than any other fast food joint I’ve yet to come across in London. The burritos and tacos aren’t perfect and I’d be surprised if they weren’t bettered elsewhere, but they’re tasty enough to make me go back for more on a regular basis and the desserts are surprisingly good value too. Benito’s Hat just grabs a four star rating – let’s hope Benito’s chirpy peeps can maintain and improve upon their running start. Opening Hours: Sunday to Wednesday 11:30-22:00, Thursday to Saturday 11:30-23:00. Total cost for one person including soft drink: £14 approx (cost based on one burrito or three tacos plus dessert and a soft drink). Tags: benito's hat, buñuelos, burrito, freebird, guacamole, horchata, ice cream, taco, tres leches cake. Bookmark the permalink.